Waking up in the middle of the night to the sound of scratching is no joke. All is quiet outside, and your hearing becomes fixated on the gnawing and scratching somewhere close by. At first, you think it’s your imagination playing tricks, but then it suddenly dawns, there are mice running around in the walls or maybe ceiling spaces in your home. Of all the rodents, mice are probably the greatest explorers and climbers. They can find their way through the skeleton of a house very quickly. We’ve seen in laboratories that mice are bright enough to figure out mazes, so a family home is no problem at all to them. Mice can climb inside walls and ceiling spaces, and gnaw through plastic, wood, plaster and drywall. The only materials that defeat mice are glass, metal and concrete. As mice leave a scent trail where they have been, they can create routes through the walls and ceilings of your home that are like mini-highways. Mice may be small, but they can cause a considerable amount of damage to a home. If left to infest a property, they can, over time, wreck it. Mice are great nest builders, and they will gnaw away at just about anything they think will be useful in creating a nest. Anything they can get their teeth into, such as wood, plastic, cloth, paper is fair game as far as the mice are concerned. Because they will eat away at just about anything, electrical wiring can be particularly vulnerable to a mice infestation. They will tunnel through any home insulation to get at the wiring in drywall. The actions of mice are known to be the cause of a number of house fires where the wiring has been eaten away and shorted. The rodents have no respect for appliances either and are known to nest in large electrical appliances. This can be highly dangerous as their tendency to chew at just about anything can lead to the appliances being destroyed, or becoming a potential fire hazard. Mice have an acute sense of hearing, so the more hidden away the place, the more attractive it is for them to build a nest. When mice and other rodents make their way through your home, they will leave a urine trail and droppings which can harbor a number of deadly diseases. The scent trail they leave gives a signal to other mice that your home is a safe place to live. The first thing to point out is that you have to stop mice from getting into your property before tackling the rodents themselves. There will be one or more small entrances the mice have created to get inside the building. Look around the outside of your home for gaps in siding, broken air vents, or other holes. Try and look at it from a mouse point of view, and check under things to see if there is a hidden entrance. Food often attracts mice, so make sure you never leave food out in the kitchen overnight, and that the garbage is disposed of in a sealed container regularly. If you want to block mice from getting into your home, then the only materials that rodents can not chew through are metal, glass and concrete. If you can use a piece of metal to block their entry, all well and good. However, if it is part of your ventilation or drainage system, and needs air or water flow, then a hard barrier will not work. Stainless steel kitchen scrubbers are a great solution. They allow water or air to flow and create a barrier mice are unable to chew through. Using two or three in a hole is usually enough to stop mice from re-entering the property. Poisoning mice may be one of the more effective ways of killing the rodents, but it can cause more problems than it solves. Poisons are also dangerous to humans and pets. However, the main problem with toxins is that they don’t kill mice straight away, which means the rodents are likely to return to their nest before they die. 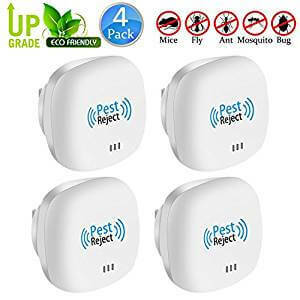 The nests are always in out of the way places, so when the mice die their rotting carcasses can give off an awful smell and attract other bugs, adding to the problems. If you are going to kill the mice, then setting a trap is a quicker and cleaner option. Mice are very sociable, and if you hear a mouse running around in the walls or ceilings, then chances are there will be up to half a dozen in the nest. 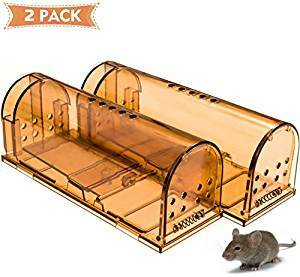 So if you want to get rid of your rodent infestation quickly, it is better to set more than one trap and to check and clean them daily. 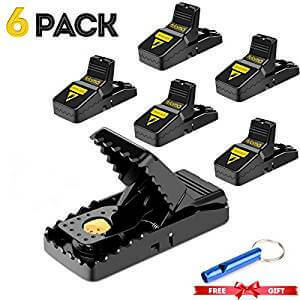 A number of different types of mouse trap are available. Probably the most humane and hygienic way to kill mice and other small rodents. To operate you open the lid and lay the bait at one end of the trap. A mouse is forced to enter all the way into the trap to get to the bait. Once it’s inside a high voltage electric shock kills the mouse in moments. The dead rodent can be tipped out into the trash and the trap re-baited. These traps have a high success rate and can be reused over many years. Because the trap is enclosed in plastic, you do not have to handle a dead animal. The traditional wooden mouse trap has been upgraded to a new improved plastic variety that can be reused. The plastic snap traps have a small cup for the bait; peanut butter is ideal. The lever goes back 90 degrees, meaning the trap is sprung that much quicker than the older wooden models where the lever went back 180 degrees. The drawback for many people is that you have to handle the dead mouse when removing it from the trap. 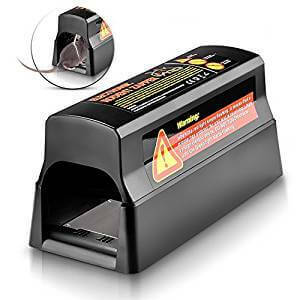 If you are worried about having snap traps around pets and children, then the enclosed variety should be much safer. These are one-use disposables, so there is no need for you to touch a dead rodent. They work in a similar manner to the regular snap trap. However the trigger is not so sensitive, and small mice can escape with the bait. Expert advice suggests adding a nut or raisin to the peanut butter making the mouse stay a little longer in place for the trap to trigger. Catch and release mouse traps can be made of metal and plastic. Both are baited in the normal way, and allow a mouse to enter, but not leave a small caged area. These types of traps need to be monitored more regularly than those that kill outright. If you are going to release a mouse back into the wild, then make sure it is well away from your home or your neighbors. You will have to handle the mice removing them from the trap, so if you have a phobia, then it’s certainly not for you. 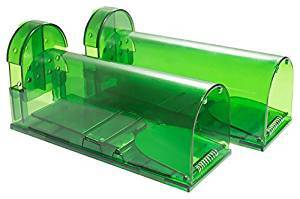 These are another disposable type of mouse trap. A mouse goes for the bait and gets caught on a sticky surface. Many people regard these as inhumane, as the trap does not kill the mouse just catch it. They are also not so effective as other types as mice can sometimes get away. If you want to drive the mice away rather than kill them an ultrasonic pest controller should do the job. The device is plugged into a wall socket and radiates an ultrasonic noise that irritates mice and drives them away. Each device will only work over a specific area, so if you have a large home, then you will probably need multiple units to have it completely covered.